The news services are reporting that the great comedian, Minakata Eiji, a member of the slapstick team the Chanbara Trio, passed away on February 26, 2010, of cirrhosis of the liver. He was 77. Minakata actually started out in real chanbara films at Toei in the 1950s, usually playing the guy who gets cut up. 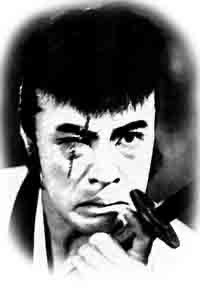 In 1963 he formed the Chanbara Trio with some of the other "kirareyaku" at Toei, including Yamane Shinsuke. Members changed over the years, but their schtick usually involved them running around on stage in samurai attire with Minakata slapping one or another with a huge paper fan (harisen). I have a special place in my cinematic heart for Minakata because he played the hitman in Kitano Takeshi's Sonatine (which I will actually be showing at the Athenee Français next week). It's a great role, and also reveals Kitano's genius in casting a comedian as a killer. Minakata appeared closer to home with other Trio members in Kitano's Getting Any?. He was a great performer and will be missed. The Asahi reports this morning that the film director and screenwriter Inoue Umetsugu passed away on February 11, 2010, of a cerebral hemorrhage at the age of 86. Inoue graduated from Keio University and entered Shintoho at 1947, debuting as a director in 1952. When Nikkatsu returned to film production, Inoue moved there in 1955 and became one of the main directors of Nikkatsu Action, working with Ishihara Yujiro on Arashi o yobu otoko, Washi to taka, and other hits. He turned freelance in 1960 and worked at most of the studios, doing everything from melodrama to gang films, but those studying Hong Kong cinema have recently focused on the fact that the mid-1960s he was invited by Shaw Brothers to come to Hong Kong to direct films. He is thus a central figure connecting Japanese cinema with Hong Kong film. Inoue was skilled not only at action cinema, but also musicals, working with major music stars even into the 1980s, when he made films for Johnny's. He also worked a lot on television. His wife was the actress Tsukioka Yumeji. The Asahi reports this morning that the film critic Togawa Naoki passed away on Feb. 5th, 2010, from a burst aneurism. He was 92 years old. Togawa was one of the few critics active from the 1930s who was still alive. He began writing in Eiga hyoron when he was still a student at Tokyo University. He was particularly active on the international level, serving on juries at film festivals such as Cannes and Berlin and writing the Japan entry in the International Film Guide for many years. He also was head of the selection committee for the Mainichi Film Concours for a long time. He began teaching in the Department of Film at the Faculty of Arts at Nihon University in the 1950s, eventually rising to becoming dean of the faculty. He also taught at other universities such as Waseda, served on many government panels, and received the Kawakita Award in 1995. He received an Order of the Sacred Treasure (Gold Rays with Neck Ribbon) in 1988. I met him many times, especially since we were both on the board of directors at the Japan Society of Image Arts and Sciences, and he was always the gentleman. Gomeifuku o oinori shimasu. I have been meaning to do this for a year, but I finally finished a Japanese page for this site. It's only one page - but rather long - and first just offers a brief self-introduction and other information that is available elsewhere on this site. What is unique about this page is that it lists up my major works originally published in Japanese, things that I left out in the English sections. Since I've written a lot in Japanese that I haven't yet presented in English, I hope this can be of help to those of you who can read Japanese. I have added brief annotations for each work. While making up this page, I noticed some other inadequacies on the site, and so added a few other things, such as list of encyclopedias I have contributed to.